Objective. 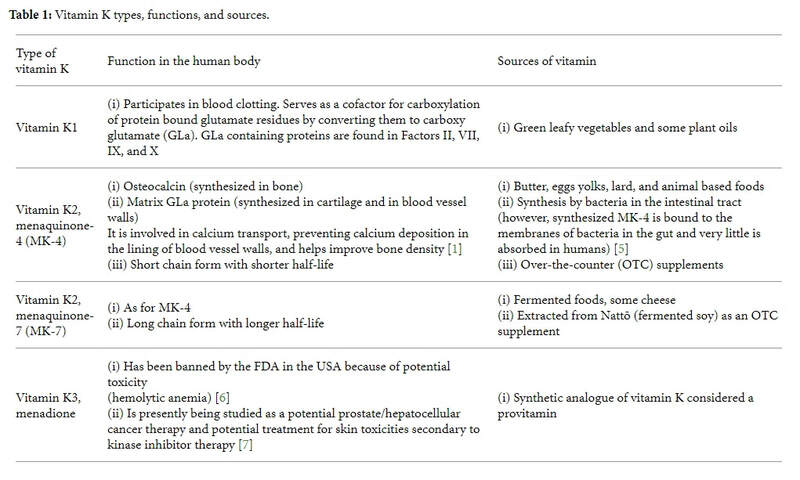 To review the evidence for the use of vitamin K supplementation in clinical conditions such as osteoporosis, vascular calcification, arthritis, cancer, renal calculi, diabetes, and warfarin therapy. Quality of Evidence. PubMed was searched for articles on vitamin K (K1 and K2) along with books and conference proceedings and health conditions listed above. Level I and II evidence supports the use of vitamins K1 and K2 in osteoporosis and Level II evidence supports vitamin K2 in prevention of coronary calcification and cardiovascular disease. Evidence is insufficient for use in diabetes, arthritis, renal calculi, and cancer. Main Message. Vitamin K2 may be a useful adjunct for the treatment of osteoporosis, along with vitamin D and calcium, rivaling bisphosphonate therapy without toxicity. It may also significantly reduce morbidity and mortality in cardiovascular health by reducing vascular calcification. Vitamin K2 appears promising in the areas of diabetes, cancer, and osteoarthritis. Vitamin K use in warfarin therapy is safe and may improve INR control, although a dosage adjustment is required. Conclusion. Vitamin K supplementation may be useful for a number of chronic conditions that are afflicting North Americans as the population ages. Supplementation may be required for bone and cardiovascular health. ​Vitamin K2 MK-7 regulates the extrahepatic movement and uptake of calcium in the body; or, more simply, K2 regulates the distribution of calcium. MK-7 activates the proteins that incorporate calcium into bones (where it is needed) and activates the proteins that bind calcium to prevent deposits in arteries and smooth muscle walls (where it increases cardiovascular risk factors). Vitamin K2 is an essential cofactor for the activation of proteins belonging to the Gla-protein family, of which one of the most studied is osteocalcin. Osteocalcin plays a role in the integration of calcium into the bone matrix, a function that defines vitamin K2 as essential to bone health. Vitamin K2 MK-7 is also essential for the activation of matrix Gla-protein (MGP).6 After MGP is activated (in a carboxylation process initiated by vitamin K2), MGP binds free-floating calcium to prevent it from being deposited in vascular smooth muscle cells.7 Without MGP activation, unbound calcium is free for deposit in arteries and vascular smooth muscle walls. In plain language, K2 prevents calcium from being deposited in arteries, making it essential for heart health. Vitamin K2 contributes to bone and cardiovascular health. Therefore, two vitamin K2 homologues, menaquinone-4 (MK-4) and menaquinone-7 (MK-7), have been used as nutrients by the food industry and as nutritional supplements to support bone and cardiovascular health. However, little is known about the bioavailability of nutritional MK-4. To investigate MK-4 and MK-7 bioavailability, nutritional doses were administered to healthy Japanese women. Single dose administration of MK-4 (420 μg; 945 nmol) or MK-7 (420 μg; 647 nmol) was given in the morning together with standardized breakfast. MK-7 was well absorbed and reached maximal serum level at 6 h after intake and was detected up to 48 h after intake. MK-4 was not detectable in the serum of all subjects at any time point. Consecutive administration of MK-4 (60 μg; 135 nmol) or MK-7 (60 μg; 92 nmol) for 7 days demonstrated that MK-4 supplementation did not increase serum MK-4 levels. However, consecutive administration of MK-7 increased serum MK-7 levels significantly in all subjects. We conclude that MK-4 present in food does not contribute to the vitamin K status as measured by serum vitamin K levels. MK-7, however significantly increases serum MK-7 levels and therefore may be of particular importance for extrahepatic tissues. MK4 stops and reverse bone loss, grows stronger bones and reduces fractures up to 87%. Another common misconception is that human beings do not need vitamin K2 in their diet, since they have the capacity to convert vitamin K1 to vitamin K2. The amount of vitamin K1 in typical diets is ten times greater than that of vitamin K2, and researchers and physicians have largely dismissed the contribution of K2 to nutritional status as insignificant. Vitamin K2 is the only known substance that can stop and reverse soft tissue calcification. Soft tissue calcification is one of the most serious health problems we face as individuals, as modern societies, and, on a global scale, as a species. Cardiovascular disease—which leads to heart attacks and strokes, and accounts for nearly half of all deaths in industrialised countries—is a disease of soft tissue calcification: the calcification of our arteries. The short answer is that K2 is found in the fat of pastured animals that graze on fresh green grass, and produced from vitamin K1 by certain kinds of bacteria in their gut. The longer answer is that vitamin K2 is a family of compounds called menaquinones, ranging from MK-4 to MK-13 depending on their molecular structure. These compounds are derived from the plant analog, the sister compound, vitamin K1, called phylloquinone, and found in chlorophyll-rich plant foods. Phylloquinone is consumed by the pastured animal, it makes its way into their intestines, and there it is transformed by the bacteria of the animal’s intestinal flora. The resulting menaquinone is then stored in the fat cells of the animal as well as in the fat of their milk if they are milk-producing. Consuming these animal fats in which vitamin K2 has been concentrated will provide this precious essential micronutrient. If the grazing animal does not feed on green grass, they get no vitamin K1. If they get no vitamin K1, their gut flora is not only compromised and negatively altered with respect to what it should be if they were consuming the grass they have evolved eating, but it produces no vitamin K2. If their gut flora produces no vitamin K2, their fat and milk will contain no vitamin K2, and neither their offspring nor any person consuming products derived from the animal will get any vitamin K2. Hence, no grass feeding, no vitamin K2 in the animal’s fat. The correct understanding is that vitamin K, through a chemical step called carboxylation, REGULATES and balances the coagulation system as a whole. Keep in mind that the coagulation system stands ready to CLOT if you are hemorrhaging to death, but it must also PREVENT THE CLOT if there are no lacerations or bleeding points. The eight proteins counter-regulate one another in this balancing act. Vitamin K is needed for this amazing feat. As we explore the healing power of higher doses of vitamin D3 at the Riordan Clinic, we have found it prudent to partner the safety and effectiveness of this dynamic duo. For every 5,000–10,000 units of D3 being recommended and tested for, we are recommending 100 mcg of K2 mk7 to be sure and prevent the inappropriate calcification that higher doses of D3 alone could cause. ​So, vitamin D3 has the role of making calcium available but at the same time stimulates the production of MGP in order for the calcium to be available to the bones and not to the soft tissues. But for this, it relies on vitamin K2. This is why vitamin D3 without vitamin K2 leads to calcification: because MGP and BGP remain inactive and incapable of binding to the calcium ions to move them into bones and out of tissues. On the other hand, plenty of vitamin K2 would indeed activate the available MGP, but without enough vitamin D3 there might not be enough MGP to confer proper protection against calcification. This is a perfect example of the complementarity of action and function in essential micronutrients. There are certainly many more, but this one is particularly remarkable.